We went on a hike this weekend in River Place to check out the waterfalls that fill the lower part of the hike in wetter periods. We were not disappointed as there were plenty of waterfalls to enjoy and take photos of. However, one of the views that caught my eye was this one with this tree holding onto the last remnants of autumn. It seems like the leaves just started to change the other day. Hard to believe it's almost over and winter is here. Hearing about the death of a former co-worker yesterday reminds me of life's journey and that it's not always smooth sailing. 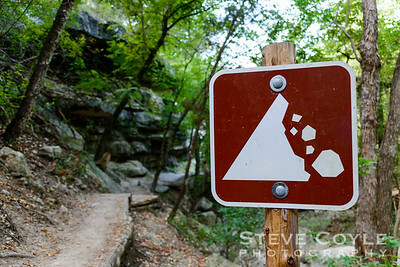 You have to watch for falling rocks at every step. Never know when you'll need to dodge one. There were a couple of these cedar cairns along the River Place trail that I hiked on Sunday. 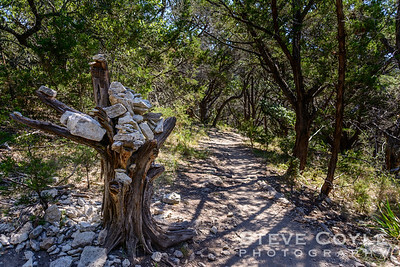 Interesting combination of an old cedar tree stump and limestone, both of which the Texas Hill Country has in abundance. I shot this in the late morning, but need to go back and capture it again earlier in the morning or late in the evening when the light isn't quite as harsh. Still, I thought it was a quite interesting way to mark the trail. Plus this trail is now a new favorite of mine now that it has been completely reopened. 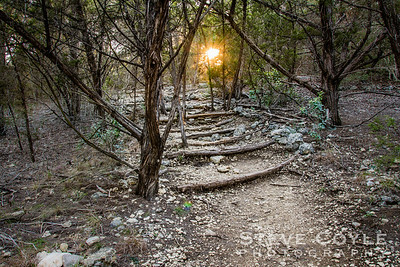 One of the more challenging trails in the Austin area from what I've seen. You'll definitely get a workout if you choose to take it on. 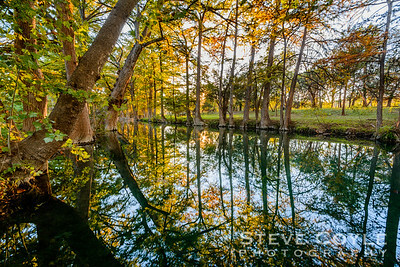 When I shot this tree in November 2013 it was out of the water and the ladder was several feet off the ground. 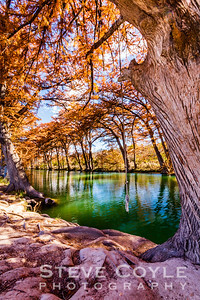 At the time it was hard to imagine this tree would be able to be used again to dive into the cool waters of the Sabinal River. 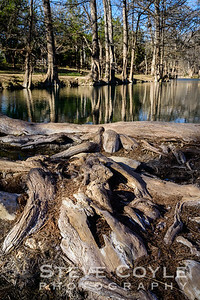 It was very nice to see the old Cypress tree once again submerged in water waiting for the summer's swimmers to arrive. 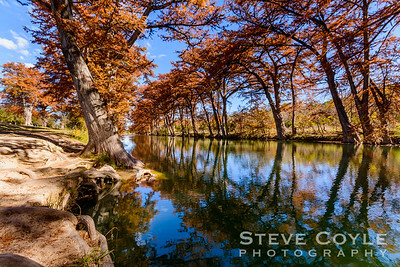 If you'd like to see what this scene looked like during the drought, you can do so here - http://www.stevecoylephotography.com/Travel/Texas-Hill-Country/i-BJRhhjc/A. Not exactly a throw back Thursday photo since I just took this last weekend, but it's a throw back to the days of when all photos were in black and white. 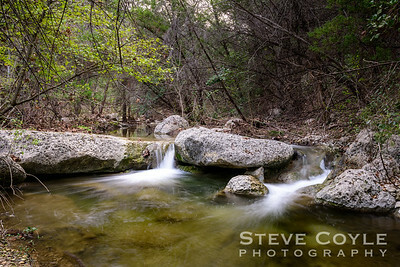 The creek was running great at my favorite close to home Hill Country hiking spot as I wrapped up my hike Sunday. Everything was sooo green from all the recent rains I decided to do something different and take in the scene in a less vibrant manner. When I was out at Doeskin Ranch last weekend I noticed a lot of the yucca with buds, but few with blooms. As I was about to turn around and head for the parking lot I found this one. 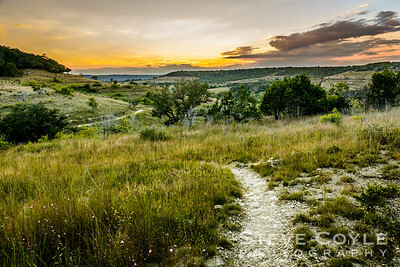 Best of all it had the bald knob hill that is part of the wilderness preserve. I took several shots of it trying to get the right angle. Close, farther away, portrait, landscape, etc. This is the one that I liked the best. 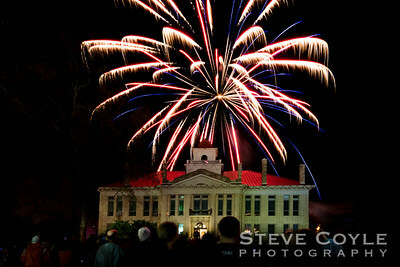 With a little Lightroom magic I was able to give it the feel I wanted. 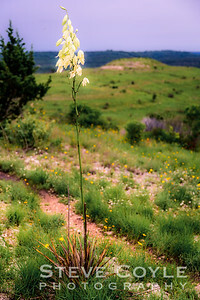 A little dreamy with some nice accents on the yucca blooms and the little yellow flowers that were around it. 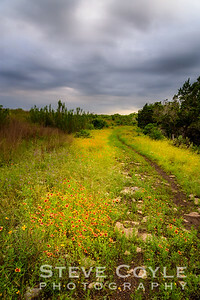 Rainy skies have led to flower laiden trails in the upper parts of Doeskin Ranch at Balcones Canyonlands National Wildlife Preserve. It was really nice to walk down the still muddy trail lined with Indian Paintbrush as thunder rolled overhead last weekend. If you get a chance to go out there for a hike I recommend wearing pants though and taking plenty of mosquito repellant. The vegetation is all grown up and some parts of the trails in the lower part of the preserve are almost overgrown. The rain has been a delight and the plants are showing off their appreciation. 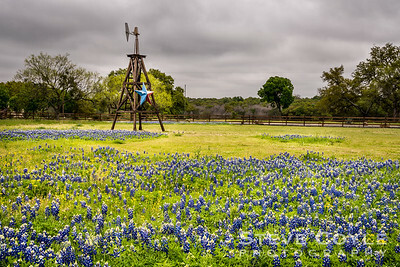 Although the bluebonnets are done for thsi year, I passed this scene on my way home at Easter. I had to stop and capture it for the record. The owner of this property really had a nice display and one I couldn't pass up. 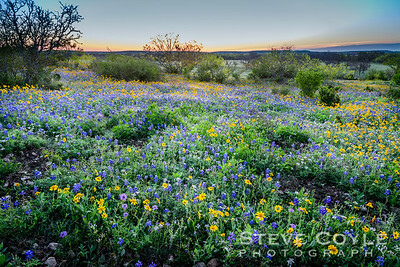 Shots like this one will have to get me by until next year's crop of bluebonnets cover the Texas Hill Country. 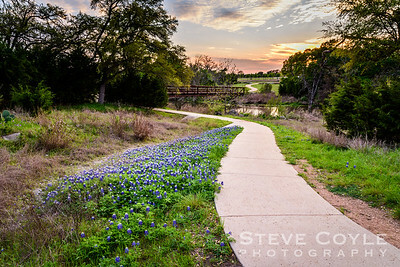 We saw quite a few patches of Bluebonnets on the Brushy Creek Regional Trail yesterday. We found this patch as we were headed back from our exploration of the trail. I made this shot on one of the neighborhood spurs to the trail. 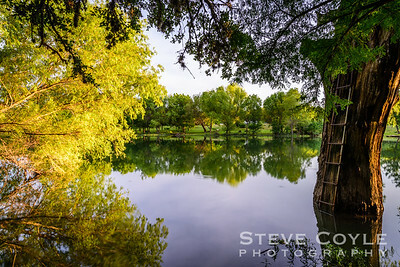 I have shot this bridge over Brushy Creek from several different angles, but this may be my favorite view of it yet. Great spot to watch the sunset if you find yourself out on the trail. 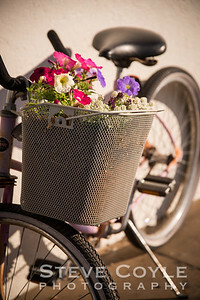 For more on the trail, check out Williamson County Parks website at http://parks.wilco.org/Home/Trails/BrushyCreekRegionalTrail/tabid/1769/Default.aspx. 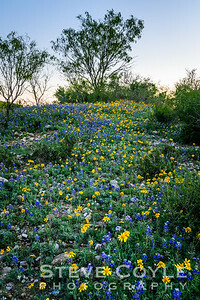 We went for a hike at Wild Basin Wilderness Preserve in Austin yesterday. 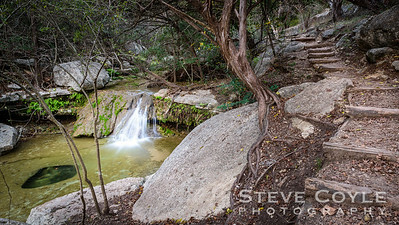 It was nice to see the waterfall in the preserve flowing. 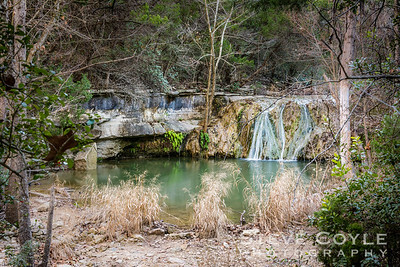 After reading Travis County's parks website I was hoping we'd get lucky and see the waterfall since it usually only flows after recent rains. 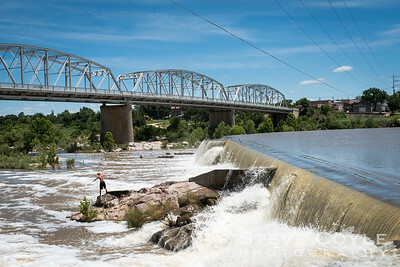 Earlier in the afternoon some musicians were on top of the falls doing a music video. I sure would like to see their finished video as I did take a few shots of them getting ready. 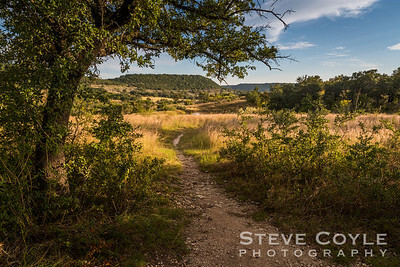 A little treasure in the Texas Hill Country with some nice benches to sit on and reflect as you take in the scene. 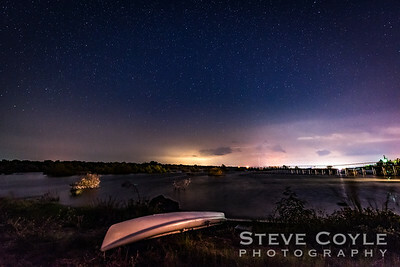 Another shot I made at Wild Basin Wilderness Preserve last weekend. 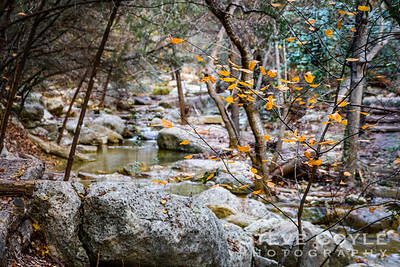 I got off the beaten trail a little and shot back up the creek to where the trail crossed the creek. You can see the stepping stones and trail in the background. 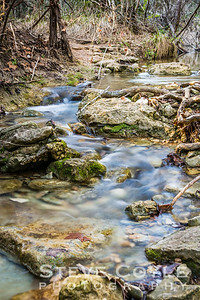 I liked the nice little S curve the stream made at this point as it flowed toward it's destination. Nice to see the water in it from the rains we've had this winter. We went for a walk in Georgetown last night on their trail along the South San Gabriel River. 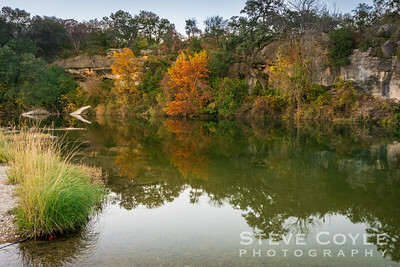 This was the scene after sunset, but before dark at Blue Hole, one of the local swimming holes on warmer days. It was nice having the park to ourselves, other than a few people taking family pictures. 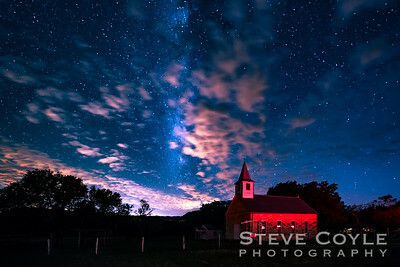 This is definitely a location I would go to with anyone in Georgetown that would like to have family portraits made. 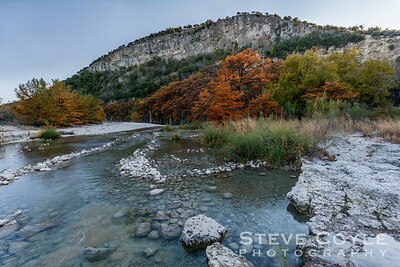 Another shot I made from our stop along the Medina River in Bandera a few weeks ago. I sure would like to be back on that river bank enjoying the view again, but I'm glad for the photo so I can return there right from the comfort of our home. Happy Thanksgiving! 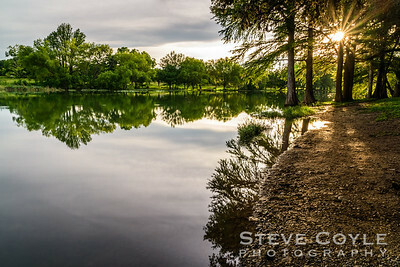 We stopped by the Medina River in Bandera, Texas on our trip home Monday. 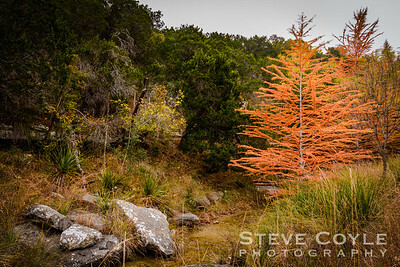 The cypress tress were exploding in color and made a great contrast to the green water of the Medina. Beautiful spot to spend an afternoon in the Texas Hill Country. 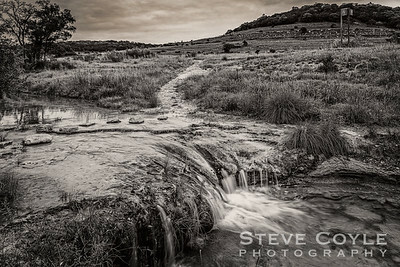 We spent the afternoon on Sunday driving through the Texas Hill Country. 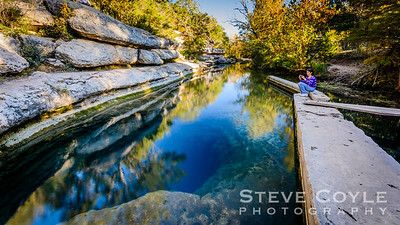 After a stop at the overcrowded Lost Maples State Park, we made the short jaunt over to Garner State Park to see what colors we might find along the Frio. We were not disappointed as you can see in this shot. 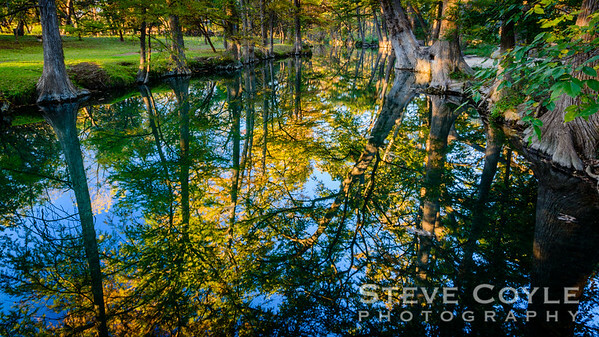 I have always loved the clarity of the water in the Hill Country streams and you can see it in this shot with the roots of the cypress trees extending into the river. The deciduous trees were in full blazing glory as the sun lowered in the western sky. 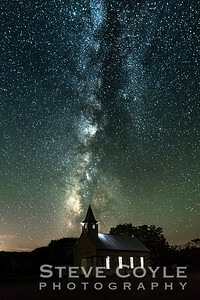 It really was a magical moment in one of my favorite Hill Country destinations. 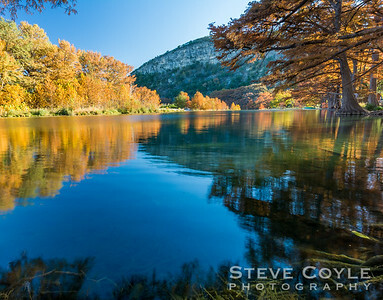 Fall has arrived in the Texas Hill Country. 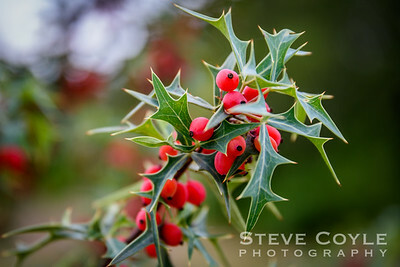 I made this shot on a hike around Selah - Bamberger Ranch Preserve last weekend. 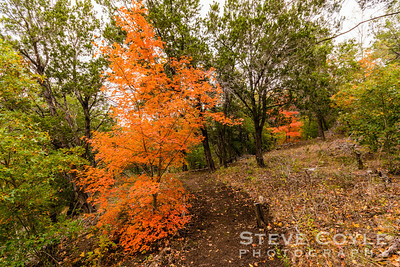 Many people think of Lost Maples State Park when they think of fall colors in the Hill Country, but the maples along this trail on the ranch were as colorful as any I've seen at Lost Maples. Only difference is the public can only access this property a few times a year and group sizes are limited. If you're lucky enough to have a chance to see the ranch in the fall, GO! Although this may look like I'm artistically tilting my camera, I can assure you this was shot on the side of a steep hill and this was taken from a level angle. 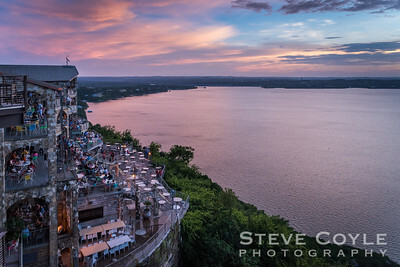 Helps to understand why this area is called the Texas 'Hill Country'. 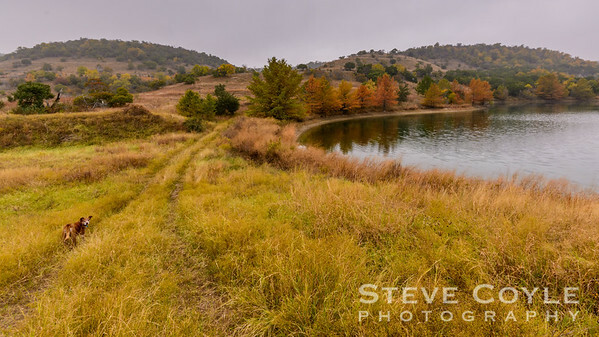 Closing out the work week with another look at the fall colors at Selah - Bamberger Ranch Preserve. 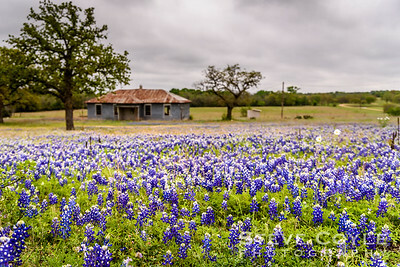 Some people mistakenly believe that they cleared all of the cedar trees from that property in the Hill Country, but as you can see here, that is not true. The Golden Cheek Warbler and Black Capped Vireo depend on the cedar for nesting, so the managers of the ranch stress that there are still cedar on the property, they just aren't allowed to take over everything as they had when the property was purchased in 1969. 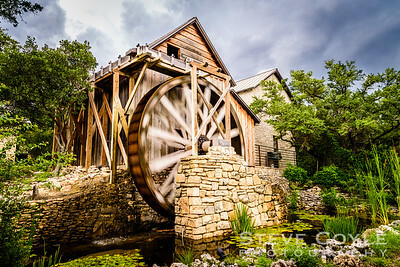 To find out more about this beautiful piece of the Texas Hill Country check out their website at http://bambergerranch.org. We went out to Doeskin Ranch last night to see if the Monarch butterflies were coming through yet after I thought I had seen a couple in our neighborhood last week. We didn't see any Monarchs and I almost thought sunset was a bust since most of the clouds had been low on the horizon. 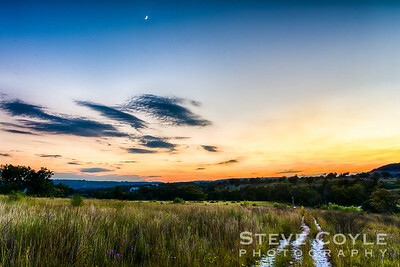 But as I was walking back to our van I saw this scene with the crescent moon chasing sunset and knew the photographic trip wasn't a complete bust. 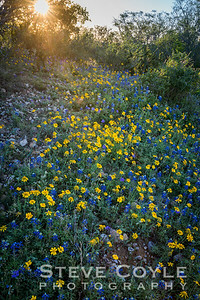 The Indiangrasses were as tall as I've ever seen them at the preserve and the horsemint and other flowers made for a nice hike through the Texas Hill Country on this early autumn evening.